Renewable Energy is defined as any energy resource that is naturally regenerated over a short time scale and derived directly (e.g., thermal, photoelectric) or indirectly (e.g., wind, hydropower, biomass) from the sun or other natural mechanisms. Each facet of renewable energy, i.e., the generation, storage, transport and distribution, provides unique challenges and opportunities. Sustainable energy production and its use are important features for adequate energy services for satisfying basic human needs, improving social well-beings, achieving economic development and keeping the quality of life of current and future generations without exceeding the carrying capacity of the ecosystems. Bio-gas is one of a renewable energy that can be used as an energy resource to substitute firewood in public area such as hotels, hospital, universities, etc. As defined by Wikipedia, Human waste, also known as human excreta, is a waste type usually used to refer to byproducts of digestion, such as feces and urine. There are many different ways in which human waste can be collected, treated and disposed or reused, depending on the sanitation system that is in place, e.g. starting with the type of toilet that is being used. The situation differs vastly across the world, with many people in developing countries having to resort to open defecation for lack of other options where the human waste is deposited in the environment, while others can use flush toilets where the human waste is mixed with water, transported and treated in sewage treatment plants. Children's excreta can be disposed of in diapers in municipal solid waste but on a worldwide scale it is also often dumped into the environment, leading to public health risks. Organic Waste is undesirable matter, which is most frequently generated by human activity that causes environmental pollution. Therefore, domestic biogas production is one of the most promising method of biomass wastes treatment because it provides a source of energy while simultaneously resolving ecological, environmental and agrochemical issues. The provision of bio‐energy tackles both energy poverty and the reliance on polluting and Non ‐ Renewable fuels as a result matured bio-gas production technology has led to the development of a number of bio-gas appliances for lighting, power generation, and cooking. The most promising among them is the bio-gas energy in order to meet the energy requirement for cooking application at domestic and community level. In this paper, an attempt has been made to design and develop a cylindrical torpispherical fixed dome bio digester for cooking application. All urban and rural areas. System will do away with the need for the existing elaborate Sewage Treatment System and reduce the load of the existing garbage collection system. Anaerobic Digestion (by Bio-Digestors) in the absence of oxygen (inside underground concrete Bio-Domes constructed). This leads to safe and total removal of harmful pathogens in the human waste and produces Biogas and Slurry (which is composted to create Bio-Fertilizer). Both will earn revenues for the solution provider. A way from the public gaze, South India’s first plant producing CNG (Compressed Natural Gas) from waste from hotels and poultry farms has completed its first year of operations. The plant is supplying 600 kg. of CNG to the Bengaluru’s restaurants every day, as reported in The Hindu. The innovative plant was envisioned and set up by T. Ananda, an agriculturist, two years ago even while the city was in the throes of agitation at Mandur against landfills. It is currently taking 25 to 30 tonnes of waste. The waste from poultry farms, which abound in the area, is either piped to the plant in the form of slurry or arrives by tractors. The waste from a hundred and odd hotels and restaurants, mainly around Hebbal and R.T. Nagar, is carted to the plant by Bruhat Bengaluru Mahanagara Palike (BBMP) lorries in drums, while the cattle dung is picked by workers from mainly Cantonment area and brought in lorries. Three BBMP lorries bring 10 tonnes of hotel waste a day. Twenty five tonnes of dung is collected by another four lorries and five to seven tonnes of poultry waste also comes in. The poultry farms are paid for the waste at 30 paise a kg. Biogas reactors are often installed at household or community level in rural areas for the co-digestion of animal manure and toilet products. Often, bio-gas reactors are directly connected to private or public toilets with an additional access point for organic materials. 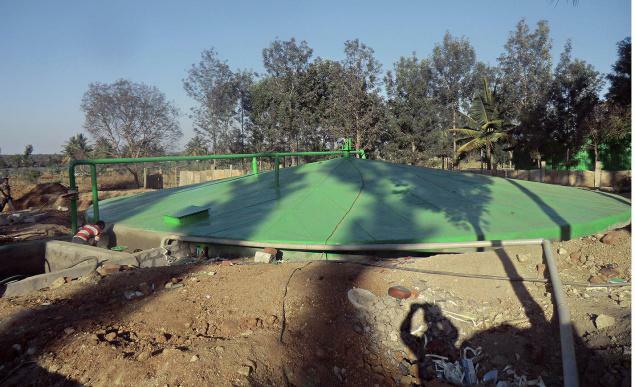 The installation of bio-gas plant leads larger cost saving in addition to environmental and sanitation benefits. When the households implement this project, they also play a great role in improving their living standards, environment and creating jobs opportunities for those construct a digester. Therefore investing on bio-gas is viable option for the production of renewable energies that are important task for our environment. It is our duty to maintain the surroundings by implementing this kind of renewable energy systems at our households. Biomass energy is going to be the important source of energy in near future as it derives directly from the wastes (in any forms), otherwise we just dump into the environment through municipal waste processing systems.